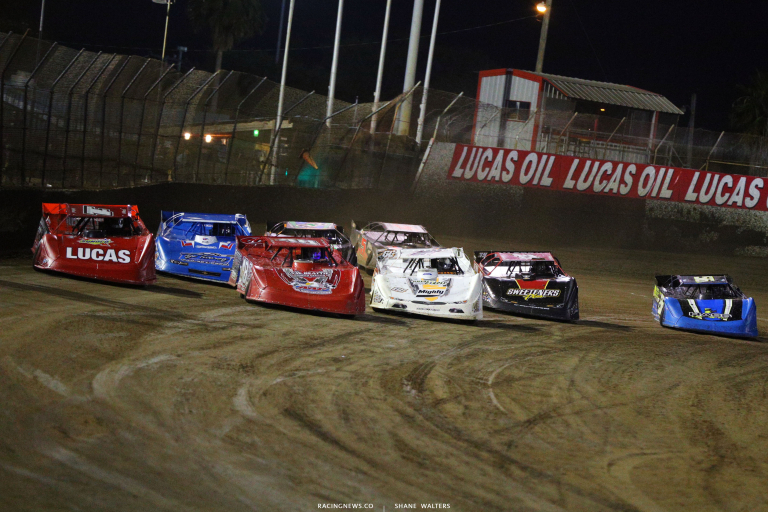 The Lucas Oil Late Model Dirt Series will pay $7,000 to the winner of tonight’s main event. That’s a $2,000 increase over previous nights. Jason Jameson lost power on his qualifying attempt. He coasted around to complete one lap. Colton Flinner and Earl Pearson Jr set the front row in the first heat race of the night. Green, they run side by side through turn one. Pearson noses ahead on the top off turn two. They cross, Pearson to the bottom. Flinner holds the lead on the top. Lap 6, Flinner runs wide off turn two. He gets into the loose dirt, the backend steps out and Pearson drives by on the bottom. There’s a spin behind them. The caution is out and Flinner will get the lead back. 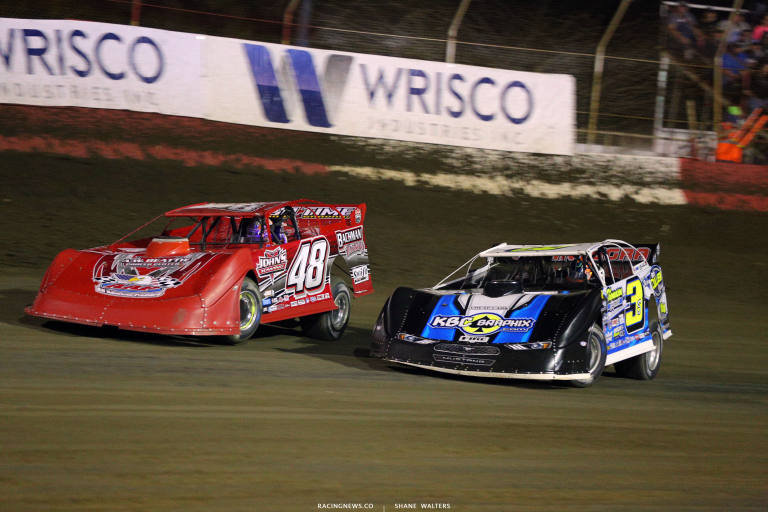 Green, Billy Moyer drives around Pearson using the top lane. Move him to 2nd. The top three run nose to tail. Flinner takes the win in the first heat race of the night at EBRP! 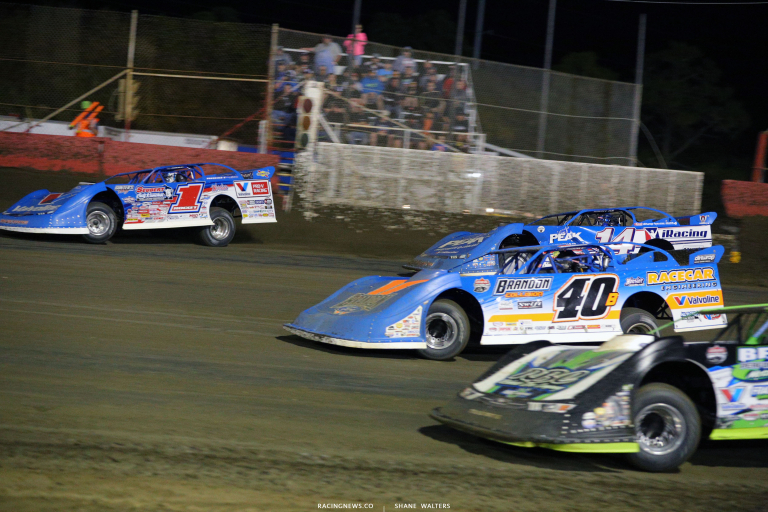 Morgan Bagley and Don O’Neal lead them to the line in heat two. Green, false start. Green, they run even through turn one. O’Neal carries momentum off the top. He powers by down the back. Satterlee closes on them. The top three are bumper to bumper. Don O’Neal takes the win in heat two! 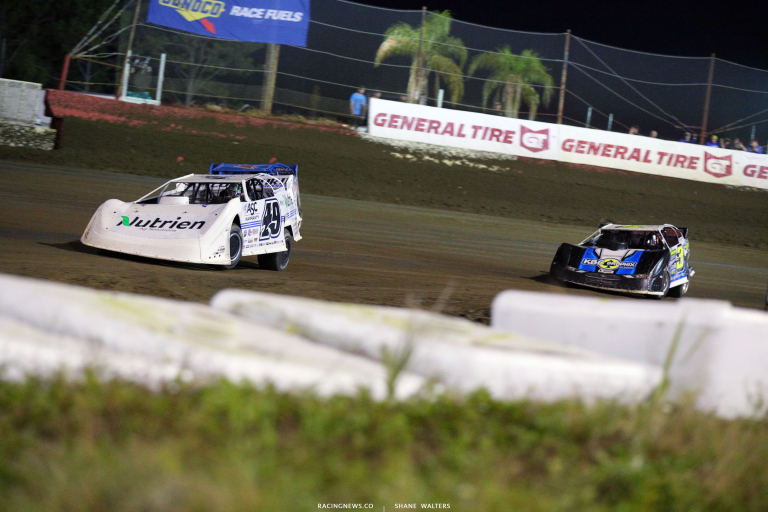 Jonathan Davenport and Justin Williams trail the pace truck in heat three. Green, Davenport leads into turn one. 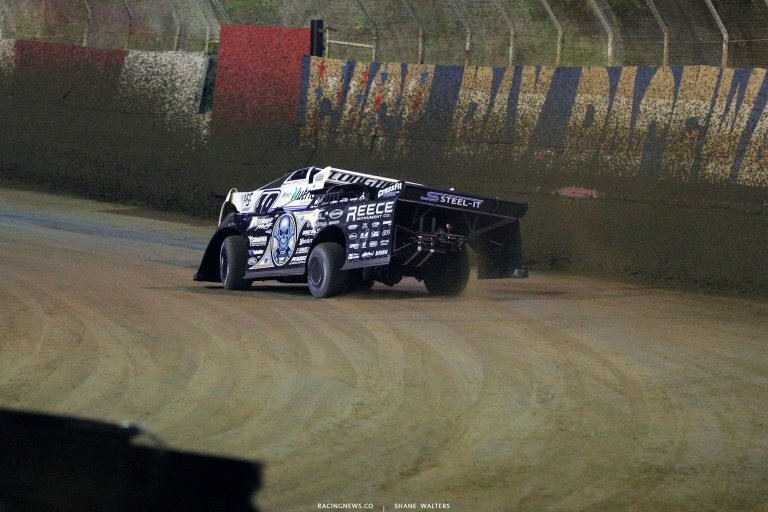 Bloomquist picks Williams on the bottom into turn three for 2nd. Richards gets into the loose stuff and the field drives by. 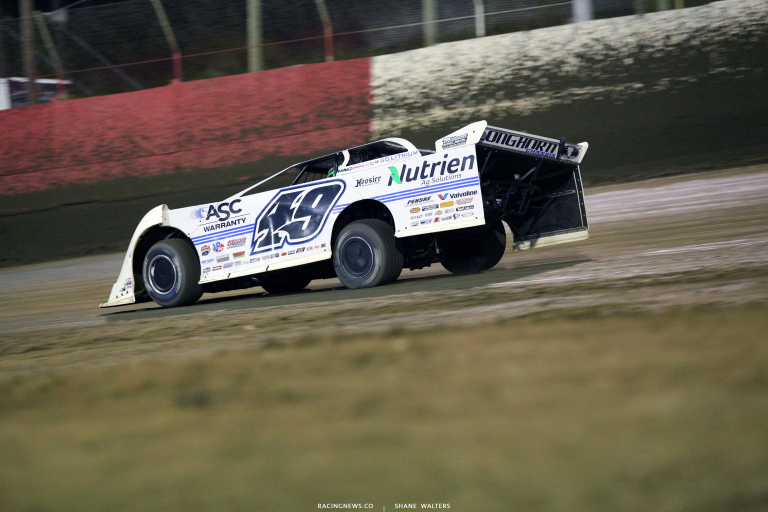 Bloomquist is running down the leader. The gap was 8 car lengths. It’s down to one. All the leaders run the cushion. The top two have broken away. Davenport hangs on to win heat three! Brian Shirley and Tyler Erb lead them to the flag stand in heat four. Green, Shirley and Erb fight for space into turn one. They didn’t make contact but it couldn’t have been closer. Shirley leads off turn two. Bronson runs wide off turn four. He loses several spots. Shirley opened a multicar gap. That gap is now gone with 1 lap to go. Shirley holds him off to win heat four! Ryan King and Brandon Sheppard line up first for heat five. Green, Sheppard wins the race off turn two. Jimmy Owens is rolling through the field in a hurry. Another and he’s now running 2nd. He sets sights on Sheppard. Owens is quicker and he’s looking for a way by on the bottom. He pulls to his number and even. Final lap, they fight for space into turn one. Sheppard pinches his entry to turn three and that’s enough to prevent a slide attempt. They drag race to the line and Sheppard takes the win! Dennis Erb Jr and Tanner English lead them to the starting line in the final heat race of the night. Green, English gets the jump. Erb Jr slots in 2nd. English is driving away. Lap 5, Overton slides Moyer and Moyer runs wide off turn two. Moyer slides him back but Overton crosses him. That’s a battle for 3rd. Tanner English cruises to the win in the final heat of the night! 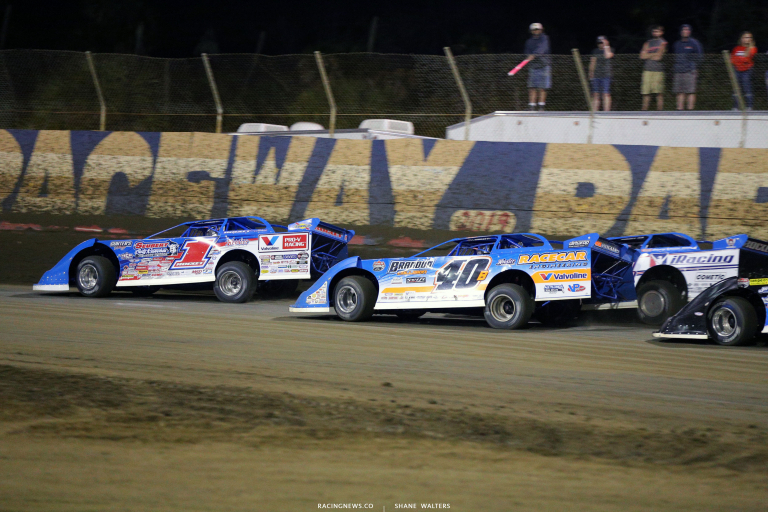 Colton Flinner and Brian Shirley lead the field on the parade laps at East Bay Raceway Park. $7,000 is up for grabs to the feature winner after 40 laps around the 1/3-mile track. Green flag, Flinner slides from the bottom to the top. He’s barely clear. Lap 2, Shirley cuts to the bottom in turn one. He pulls even. They run side by side off turn two. Flinner holds the lead in turn three. Lap 8, Shirley has another look on the bottom in turn 1. Even off turn two and clear into turn three. 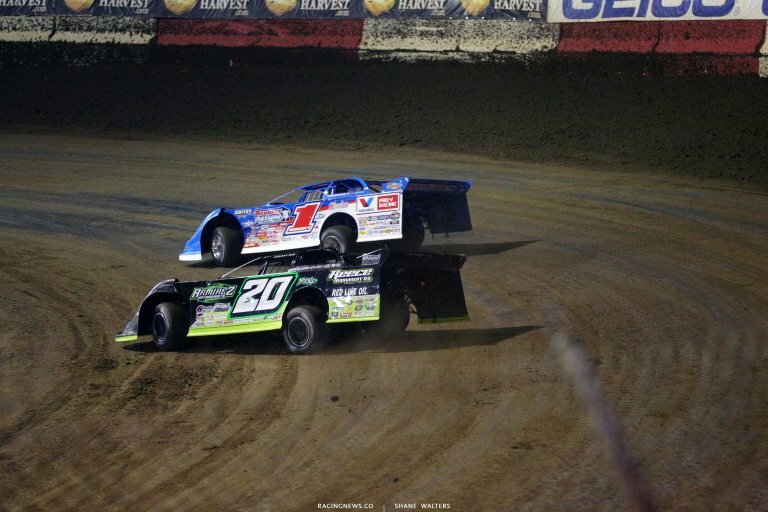 Lap 9, Davenport has closed on both of them. He tries the bottom in turn one. He runs even with Shirley for the lead off turn two. Davenport drives it deep into turn three, clear. Tyler Erb and Brandon Sheppard split Colton Flinner off turn two. Move Tyler Erb to 3rd. Lap 19, Dennis Erb Jr is around in turn two as Stormy Scott and Earl Pearson Jr tangle. The caution is out. Green, Davenport leads Shirley. Sheppard works to the inside of Tyler Erb, he takes 3rd. Lap 21, Tanner English is around on the front stretch. The caution is back out. Green, Sheppard tries to cut to the bottom in turn one. He pinches off the line for Shirley. Sheppard has the momentum off the corner on the outside as Shirley checks up. Tyler Erb gets a run to his inside. They split Shirley through turn three and four. Sheppard takes 2nd. Car around in turn one. The caution is back out. Bloomquist heads for the pits and back out. Green, several cars rub fenders and check up in turn one. Richards is on the gas around the cushion. He picks up several spots. Sheppard moves to the top. He pulls even with Davenport. Clear around the outside, Sheppard leads. Lap 25, Flinner is slow. The caution is out. Green, Richards to 2nd on the bottom lane. Back in turn one, Richarda heads for the top. Sheppard and Bronson drive by on the inside. Richards carries the highside momentum down the back. 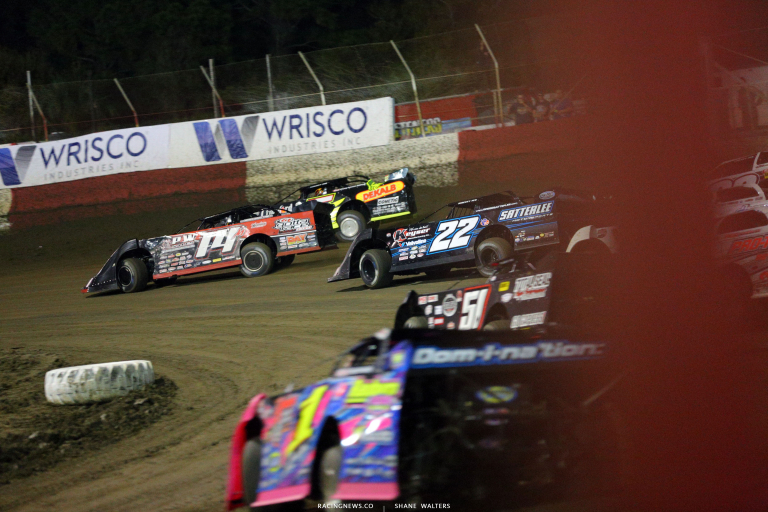 He slices between Sheppard and Bronson and heads for the bottom in turn three. They both get by once more. Moyer Jr jumps the cushion and comes to a stop. The caution is back out. Green, three wide for 2nd in turn one. Tyler Erb has a run on them all. 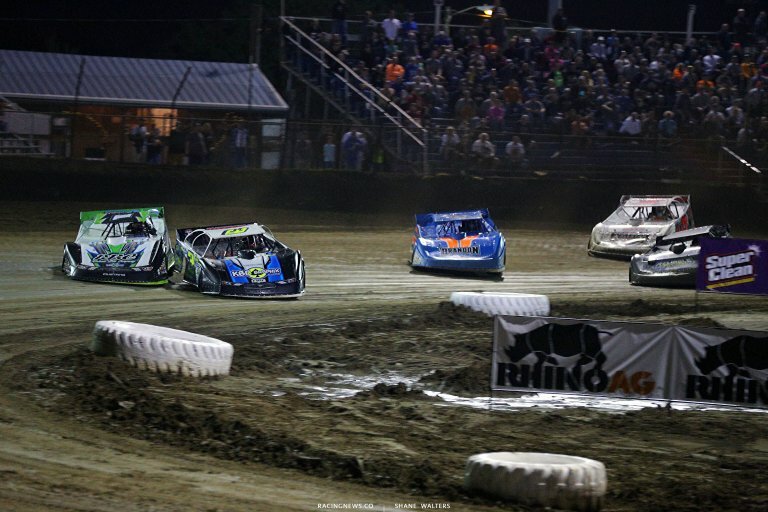 Four wide off turn two!! Tyler Erb takes 2nd on the bottom lane. 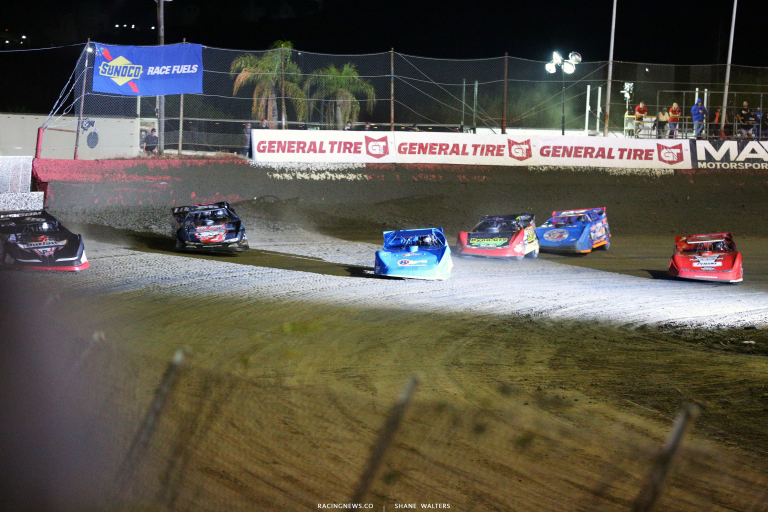 Green, Davenport leads Tyler Erb as the top four spread out. Lap 37, slow car down the back. Caition. Green, Jonathan Davenport leads. Richards is looking for 2nd. Davenport opens the gap. 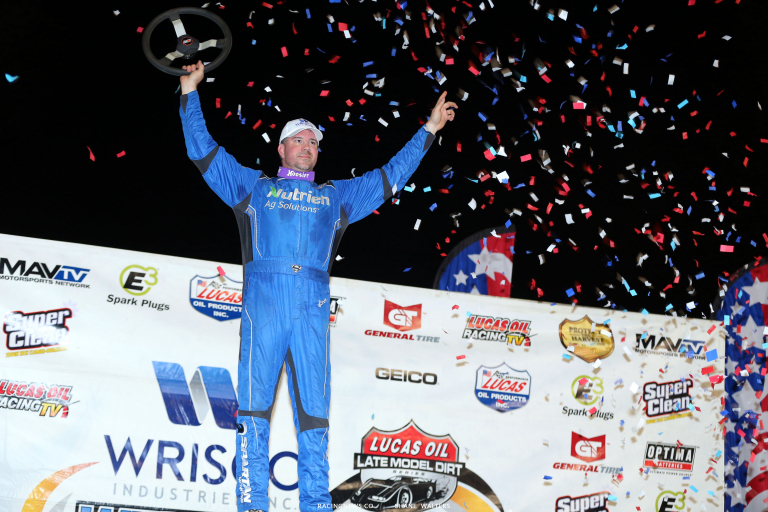 He wins at East Bay Raceway Park!